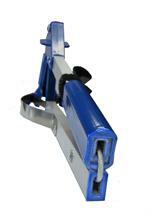 This reacher COLLAPSES in half for easy storage, also very mobile. Slip joint is very strong and easy to use -- even with only one hand (after a little practice). Strong sensitive fingers for extra wide grasp. Lift objects up to 5 lbs. and up to 4.5" wide yet as small as a dime. New nimble, matching blue silicone cups are flexible enough to pick up items off the floor as small as a dime, yet strong enough to handle a large can of soup or box of cereal. Odorless and will not scuff floor, shoes, or cabinets. Optional SAF-T-LOK (with on/off lever). 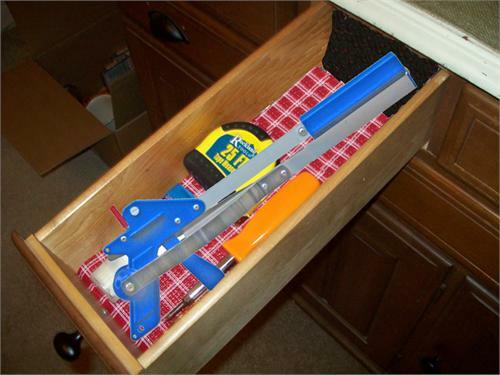 Use it to lock onto items without maintaining grasp on the trigger. 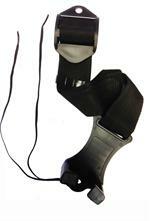 Included is a DangEZ universal hang Velcro style strapto keep your EZ Reacher® handy. No hooks, holes, or tools required. Satin finish aluminum is lightweight (10.5oz) and strong. Length 32 inches extended, 16.5 inches folded. This reacher has been so valuable for me, since I need to be able to carry one around when I am out during the day. The sliding sleeve makes it solid when extended, unlike other folding reachers I've used. Only one issue I've had: the sliding sleeve can be too difficult to slide - too much friction.